Ventnor Square Theater and Restaurant site. VENTNOR – Ventnor Square Theater owner Brett DeNafo said he is “thrilled” to be awarded the bid for the second of three retail consumption licenses in Ventnor. DeNafo and his partners in Ventnor License, LLC join Blake Barabuscio, winner of the first liquor license, in their efforts to revitalize the city by developing full-service eateries in the downtown area. DeNafo is redeveloping the long-abandoned Ventnor Twin movie theater site into the Ventnor Square Theater with a burger restaurant on the second floor. Barabuscio, who received the first license with his bid of $77,100, $2,100 more than the minimum bid amount, plans to redevelop the Arrow Hardware store on Ventnor Avenue into a Santucci’s Original Square Pizza restaurant. Formal sealed bids and affidavits of qualification for the second license were due at 10 a.m. on Friday, Nov. 2 and opened at 4:30 p.m. According to Mayor Beth Holtzman, two bids were received. Megu Sushi, LLC on the 5200-block of Atlantic Avenue bid $82,200, $5,100 higher than the minimum bid amount of $77,100. Ventnor, LLC’s high bid was $91,100, she said. 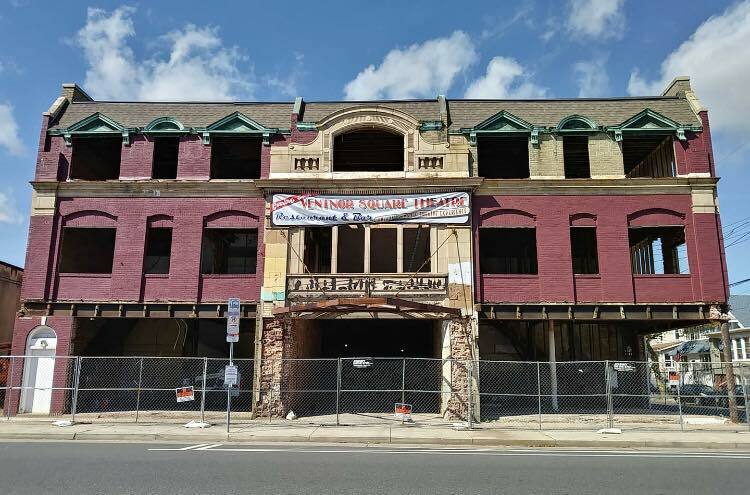 “They came to Ventnor with plans to open the theater with a restaurant, so having a liquor license is key for them,” Holtzman said Monday morning. The Board of Commissioners will award the bid at its meeting on Thursday, Nov. 8. DeNafo and his partners will then undergo a thorough police investigation and must past the muster of the NJ Alcohol Control Board. “We already have a liquor license in Stone Harbor, so we should be ok,” DeNafo said Monday. There are no complaints against that license and the company has the “best liquor license lawyer in the state,” he said. “This is the last big hurdle we had to overcome,” DeNafo said. The company plans to submit an application for site plan review this week and will likely go before the Planning Board on Monday, Nov. 26. “We will be submitting our plans for the parking lot and outdoor deck, and if all goes well, we will start building in mid-December, before the weather gets too cold,” he said. The company has gutted the building and is currently reinforcing it with some new steel beams, but the building is structurally sound, he said. “It’s in better shape than we expected and there nothing really major that has to be done,” he said. DeNafo promises the building will be “a really cool place” and will “have a good flow,” he said. He said he is encouraged by the reaction of residents. Once the site plan has been approved, the new construction will begin in earnest. Although Ventnor has many BYO restaurants, none at this time are licensed to sell liquor by the glass. Voters approved a referendum on Nov. 2, 2016 allowing the city to issue retail consumption licenses. 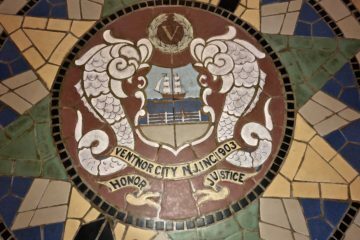 Based on the city population, Ventnor is entitled by NJ Liquor Control Board regulations to issue up to three licenses. Holtzman said the city has no plans at this time to put the third liquor license up for bids. Holtzman said there have been some “rumblings” about businesses interested in pursuing the third license, but nothing is set in concrete. “I don’t see the real hurry to put it up for bids,” she said.